The 2013 Consumer Electronics Show had 3,250 exhibitors showing off 20,000 new products spread over nearly 2 million square feet. No doubt, you've read about many of these new products already, including on our own Photos & Comments pages. But, if you are someone responsible for the future directions of your company, the trick is to spot the strategic power shifts in the markets. These power shifts can hint at new growth opportunities for you company, or indicate threats to your company's existing businesses. 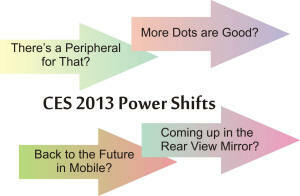 We also touch on one threat to established consumer electronics companies that was quite visible at this year's CES.